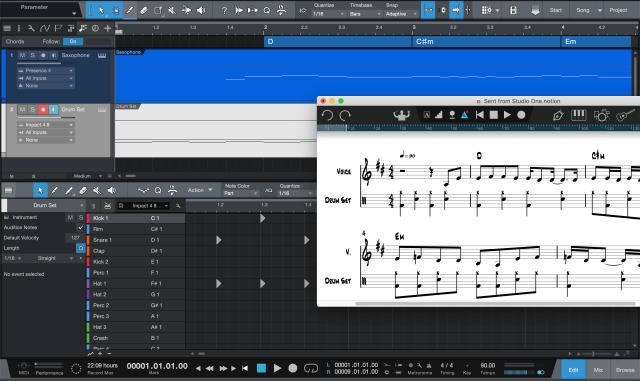 With version 6.5, PreSonus has improved Notion in multiple ways, including further integration between Notion and PreSonus’ Studio One® 4 recording and production software and features no other music notation software offers. For example, when drum tracks are transferred from Studio One 4 to Notion, they are now automatically translated into standard drumset notation. This timesaving feature could be especially useful during a session, as you can go from a Studio One drum pattern to a printed or PDF version in just a couple of clicks. Chords imported from Studio One’s Chord Track now automatically play back in Notion if slash notation is present, which is great when finishing off a composition. All imported chords from Studio One can be quickly selected and edited in one go with Select Special>Select Chord Symbols. Notion 6.5 also includes a major update to its MusicXML implementation. The MusicXML file format is used for exchanging scores with other compatible notation applications, and the improvements in 6.5 make it even easier to switch to Notion or to add Notion to a creative workflow. Along with support for the newer .musicxml extension, version 6.5 features expanded import and export support for a wide assortment of articulations and symbols. The update also includes new guitar tablature support for better compatibility when sharing guitar files, particularly with other tab-focused applications. Notion 6.5 also introduces a new way of dealing with voices on grand staves that provides much greater uniformity when, for example, sharing piano music between applications. Version 6.5’s new tremolo entry method is faster and easier than ever, with a number of new engraving and playback features. Notion’s built-in instruments now play tremolos even in the absence of a sample, as well as playing measured and unmeasured tremolos that include chords. Slash notation, too, has been enhanced, with a new layout for legibility and auto-playback of complex chords, including support for chords with different bass notes. Notion’s constant focus on both notation and playback gives the user new levels of detail and accuracy. Notion 6.5 includes an assortment of other enhancements and fixes.